Later 19th century. 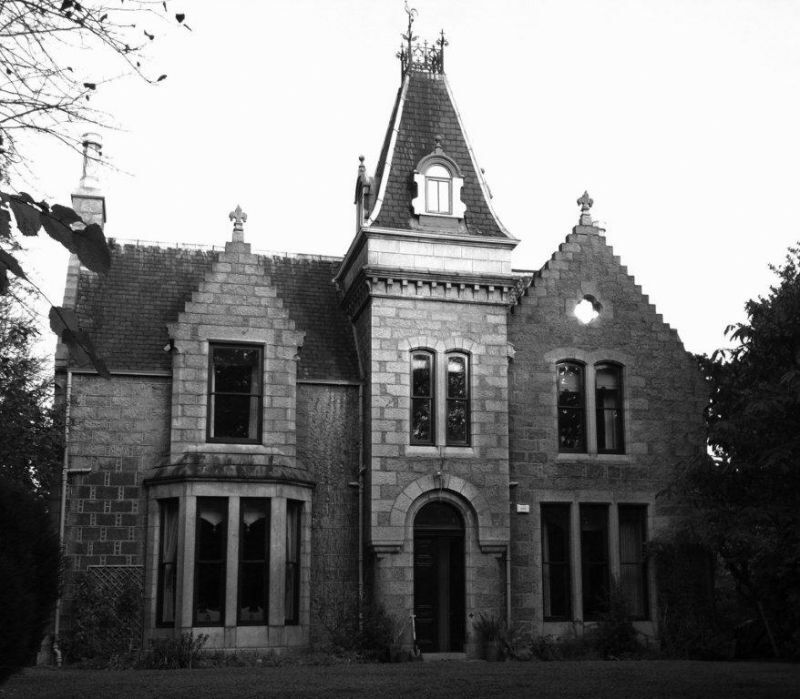 2-storey and attic, 3-bay Scots Baronial villa with French detailing. Tooled coursed Aberdeen bond grey granite with contrasting light grey long and short dressings, finely finished to margins. Base course; chamfered reveals; finely finished stop-chamfered quoins; crowstepped gables. S (PRINCIPAL) ELEVATION: asymmetrical; slightly advanced, engaged square-plan entrance tower to centre, rounded angles at ground floor, corbelled to form square-plan at impost level, round-arched stop-chamfered doorway with scrolled stops to ground floor, 2-leaf panelled timber door with fanlight; bipartite to 1st floor above; eaves cornice on dentil moulding, steeply pitched truncated pyramidal spire with decorative iron brattishing including weathervane, decorative timber round-arched window to each elevation. Gabled bay to right, tripartite window to ground floor; segmental-arched bipartite window above; quatrefoil window set in gablehead, fleur-de-lys to apex. 4-light canted window to ground floor of bay to left, rising to form advanced gableted window with stop-chamfered angles at 1st floor, breaking eaves, fleur-de-lis to apex. E ELEVATION: not seen 1999. N ELEVATION: asymmetrical; irregular fenestration to ground floor; window breaking eaves with catslide roof to centre of 1st floor, flanked to left and right by gableted windows breaking eaves. W ELEVATION: asymmetrical; 3-bay; recessed central bay, modern porch to ground floor; gableted pointed-arched decoratively leaded window to centre of 1st floor, flanked to left by four-centred-arched window and to right by segmental-arched window; triangular-plan dormer to right of attic floor. Gabled bays advanced to bays to left and right, irregular fenestration to that to right. Predominantly replacement timber windows with top hoppers. Grey slate roof with lead ridge. Coped gablehead stacks with octagonal cans. Cast-iron rainwater goods with decorative hoppers. Some coped stone skews with blocked and beaked skewputts. GATEPIERS AND BOUNDARY WALLS: rectangular-plan gatepiers with decorative coping to SW, now leading to modern bungalow to rear of King's Lodge, flanked by tooled Aberdeen bond granite walls with pointed coping, stepped-up in places with squat railings between; simple gatepiers to SE leading to No 14. Formerly called King's Acre. The decorative tower combined with baronial detailing sets this among what Brogden calls the "mini-castles" on the King's Gate. The house retains much of its original detailing, notably the leaded windows to the W and the particularly decorative entrance tower.